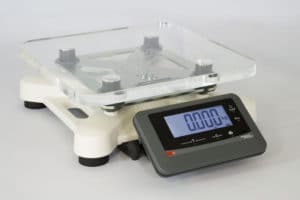 Many activities require transportable and resistant weighing devices, that can be adapted to different requirements and working stations. In line with our latest innovations, our new R1TP platform scale offers the high manufacturing quality, accuracy and reliability you need without any compromise on design. A fine technical design that allows the R1TP to integrate into any work space whether on the floor or table-top. The R1TP platform scale includes a brand new shock bumper system. Patented bumpers protect the load cell from possible overloads. R1TPs with 150kg capacity thus resist a vertical impact of 200 joules on the platform (10 joules are equivalent to 1kg falling 1 metre). R1TP: a transportable weighing system. You require an accurate, reliable and above all transportable weighing device? 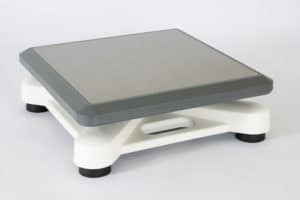 The R1TP platform scale is for you! 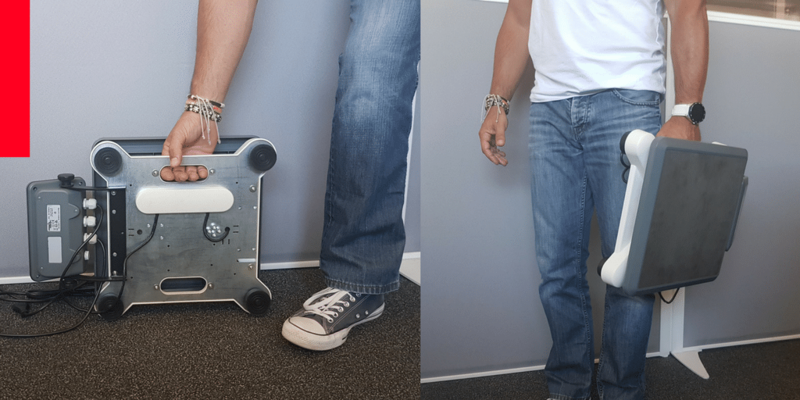 Weighing under 10kg and with minimal dimensions, you can take it anywhere you need. Moreover it provides storage for the measurement cable and is fitted with handles for easy moves. R1TP: a modular platform scale. To meet your requirements and fit to your environment at best, the R1TP platform scales come into different versions. Choose the capacity (15kg to 150 kg) and weighing electronics you want: the R1TP can be connected to all PRECIA MOLEN indicators, whether i5, i20 and even i25 touch, our latest creation. The weighing electronics can be directly fitted to the R1TP, or remote column-mounted. For your comfort, you can choose from many options, such as various column heights – unless you prefer it to be adjustable – and various fitting supports to fix the indicator directly onto the R1TP platform scale. The standard composite platform is coated with a stainless steel metal sheet. A transparent version magnifies the product’s high tech design. Need more informations? Please contact us!